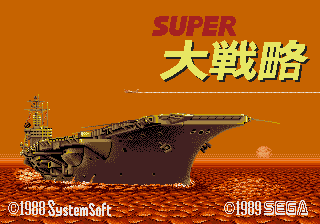 Super Daisenryaku (スーパー大戦略) is a 1988 World War II simulation game for NEC's PC-88 and PC-98 computers by SystemSoft in their Daisenryaku series of WWII sims. Sega ported it to the Sega Mega Drive in 1989, putting in a new soundtrack supposedly composed by Tokuhiko Uwabo. Not only was it never released outside Japan, but it does not fully implement TMSS, meaning it will only work on early Model 1 Mega Drives. The Mega Drive would receive a sequel, Advanced Daisenryaku, which not only does work on all Mega Drives, but also contained Mega Modem support. Main article: Super Daisenryaku/Magazine articles. NEC Retro has more information related to Super Daisenryaku.